When I first started out in perfume, it was possible to aspire to some level of "literacy", as a consumer. That is, you could, if you spent a reasonable amount of time, energy (and money), acquaint yourself with the major brands — niche, mainstream and indie — and smell at least some portion of their products. It used to be fairly rare that a commenter (or contributor) at Now Smell This would mention a brand I'd never heard of, and I usually had at least a passing familiarity with any fragrance that came up for discussion. These days, even determining which brands are "important" enough to bother with is a Herculean task. Commenters mention perfumes I've never heard of, much less smelled, every day (and I would not be at all surprised if many readers here smelled far more product than I do). When Jessica decided to review Gershwin by the Italian niche line Maria Candida Gentile, the brand was hardly even on my radar. I've now smelled two of their fragrances: Hanbury and Sideris. You all will have to tell me which others I ought to try. Hanbury, named for the Giardini Botanici Hanbury in Italy, was a lucky choice for my introduction to the brand. It starts with a juicy blend of marmalade-ish citrus and orange blossom, lightly sweet and extremely cheerful. The calycanthus1 joins in shortly, and Hanbury turns rounder and fuller and spicier, with just a tinge of a green herbal-aromatic undertone (the notes: lime, bitter and sweet orange, calycanthus, honey, acacia, white musk and benzoin). As it dries down, mimosa and honey create a powdery-sweet base and Hanbury takes on a slightly old-fashioned air. 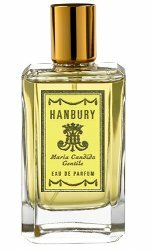 Maria Candida Gentile describes Hanbury as her most feminine fragrance, and it is certainly conventionally feminine, although I do think a man could pull it off. The lasting power is reasonably good but after a few hours, it's fairly close to the skin. Verdict: It's extremely pretty, even charming, and best of all, it doesn't smell like anything else I can think of. I do like the opening better than the closing, probably because mimosa is not always a favorite of mine. After it had been on skin for about an hour, I started wondering if it was perhaps too charming for me: probably what I need is Hanbury Eau Légère or Hanbury Eau Été or some such, that retains the orange blossom and calycanthus but eases up on the sweet mimosa base. For now, Hanbury is going in my purgatory basket for later testing. I have a feeling I might like it better in colder weather, although if I had immediate and easy access to the 7 ml mini (7 mls! what a perfect size!) I'd be mighty tempted. Maria Candida Gentile Hanbury is available in 7 (€14), 15 ($45) or 100 ($185) ml Eau de Parfum. For buying information, see the listing for Maria Candida Gentile under Perfume Houses. 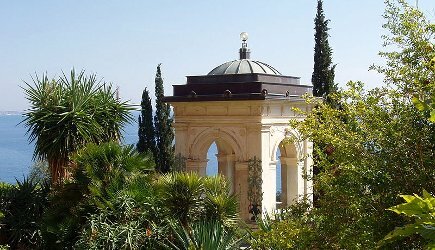 Note: top image is Giardini Botanici Hanbury - pavilion [cropped] via Wikimedia Commons. 1. Calycanthus is also known as sweetbush, western or California spicebush, and Carolina allspice, and you can find it in Acca Kappa Calycanthus and Santa Maria Novella Calicantus. You’re a posting machine today! This sounds nice, but I’ve decided that this is one of the lines I’ll just never get to, in my illiteracy. And I’ve decided the same about many, many, many brands. I used to mind not keeping up, now, really, I don’t. Most of the cream probably rises to the top, and if there’s a little serendipity in what I try and don’t try, that’s ok. Thank you for reviewing what is possibly my favorite scent of all, my wedding scent, and one that does seem to go under the radar! Buy, people, buy, buy! I don’t want it to get discontinued! (No affiliation, only obsession). Oh, how nice — I can see it being a perfect wedding scent! I was actually thinking of you while reading the review, Mrs. Mountain! I didn’t know it was your wedding scent. How nice! I’m even more excited to try it, now. Awwww. Remind me to include some. Hanbury sounds nice. I have no idea what calycanthus smells like (I wonder if there’s any “California sweetbush” around here). I’ve only smelled Sideris from the MCG line; it reminded me a lot of a favorite, Amouage Epic Woman. You’re right, 7ml would be a great size to be able to get easily. 15ml is nice too, but $45 is pushing the price point for me for that quantity. I liked Sideris too, and will spend more time with it. “best of all, it doesn’t smell like anything else I can think of.” – how wonderful! leathermountain, I have not smelled this (nor had I heard of it), but from Robin’s description, you smelled great at your wedding! I smell so many “generic” niche things these days, it really is nice to smell something reasonably interesting and well done and not obviously derivative. Now Hanbury is one niche de la niche I did try when I was in a busy phase of testing such things. I swallowed the romantic backstory hook line and sinker. I think this was about the time I also fell for Parfum d’Empire’s Eau Suave as well; it too has a romantic garden in its story. Anyway, I could only test Hanbury by buying a teeny sample from Indiescents and, probably because the sample was so small, I could not apply it as lavishly as a fragrance like this deserves. So I ended up feeling it was rather weak an uninspired. That may not be a fair judgement; I’m glad to see Hanbury has its admirers. However, I became deeply skeptical of backstory after this experience. And then, international shipping from MCG seemed to be wildly, laughably expensive at that stage. Maybe it has improved, but I’ve moved on. The small sizes would be an absolute gift if you can get hold of them easily. I would say I’m deeply skeptical of back story as a rule? I prefer a 2 sentence back story, which is all I read of this one so just as well. I understand she uses a high percentage of natural materials. I did not find this weak at all (actually, I thought the first 45 minutes were kind of heavy, but then, I have a spray vial so probably have much more of it on skin than you did) but I did think that it got close to the skin faster than some scents, and wondered if that was because she’s not using heavy concentrations of synthetic musks — which would be fine with me, I guess. Will also add that international shipping from nearly everybody has gotten comical — and that relates, as I understand it, more to newer regulations about shipment of perfume. You used to be able to buy a set of samples from First in Fragrance for something like $15, free shipping, now, someone told me the shipping alone is 30 euros if all you’re ordering is samples. Ack. Same goes for international shipping from the US to Europe — in the last couple years, it’s gotten so ridiculous that some stores no longer bother to ship internationally at all. Adding…love “niche de la niche”, I may have to borrow that! Oh do, I’m sure I borrowed it from someone else. Shipping is crazy, I agree. It is a tough environment for the indie perfumers. I just checked back through some stuff: two years ago MPG shipping to Australia was 50 euros. But now Australia is not at all in the drop-down menu of shipping destinations, so that would appear to be that. The good news is those 7 ml bottles. I don’t think they were on offer last time I looked, and the MPG online store is looking spruced up. In other good news, I am expecting a sample set from Teo Cabanel at a cost of 7.08 euros with international shipping. Seems too good to be true. Hope it turns up! The mention of the Acca Calycanthus on the SOTD post caught my attention, never having heard of it. How do the two compare? I see that SMN also has a Calicanthus, has anyone sampled that? The Acca Kappa is also sweet, but no mimosa, so a different sort of sweet. More sparkling, more “straight-forward” floral. I think of it as much more of a soliflore — this one isn’t a soliflore at all (but having never smelled “real” calycanthus, I could be way off base). And the AK is spicier. I haven’t smelled the SMN in ages, but if memory serves, darker, more amber-y. Nice review, Robin. I have to retry this. The one that called out to me was Noir Tropical…a superfabulous vanilla. The line is available in-store at Henri Bendel and this week is their Birthday Bash! On Thursday, between 5 and 9 PM, there are % off promotion / purchase: 15%/up to $100, 20%/$101-$199, 25%/$200+ and these discounts are usually on everything including perfumes and makeup. Oh nice deal! And then they’re getting rid of the whole perfume dept soon, right? Which is a shame, they always had such a great selection. Will have to try Noir Tropical. Yes, although the SA was hazy about when it will happen – June / July-ish. Sorry, I meant that to be an obvious joke about paying forward the enablers. Then I had a moment of panic, thinking that someone might take it to mean I was accusing someone of being a shill. Then I thought that was kind of funny in its own right. I have one of the smaller bottles of Exultat (beautifully reviewed on Grain de Musc), which I love. It’s an unusual and beautiful violet incense fragrance. As you said about Hanbury, it doesn’t smell like anything else. I’m glad you and Jessica have reviewed perfumes from this line – I feel it springs from an honest artistic heart as well as a capable nose. I have samples of the others that I have not focused on very yet – I think Hanbury was one that I liked – or was it Barry Lyndon? Thanks, adding Exultant to the list. A violet incense sounds lovely. They have it, & so does Indigo Perfumery & Twisted Lily…don’t know who has the better deal on samples at the moment. Thanks for this review. I don’t know a thing about this line but Hanbury sounds great to me including the mimosa! I am going to order a decant. Lovely review but now I’m waiting for one of Sideris, my favourite! I like your point about the high percentage of naturals leaving a soft impression as opposed to bombastic synthetic musks. I second the recommendation of Exultat. A gorgeous and unusual incense. I will get back to Sideris soon, I did like the 1st quick sniff. I am not even into incense at all and like Exultat, perhaps it’s the only incense I like, that’s saying something I guess! Wouldn’t mind an fb of it actually. This Hanbury sounds alright. How big is the honey note? Big enough…although with the mimosa it’s hard to break out, mimosa has a honeyed smell anyway. Omega, IMO the honey note is a real team player in Hanbury. It adds a welcome high note to the well-balanced ensemble. But it’s not that animalic honey note that I associate with the phrase “big honey.” I quite like big honey in a perfume, as it happens, but I don’t find it in Hanbury. I’d say Hanbury’s honey note is more like Goldilocks-style-Just-Right. FWIW. I’ve already stated my biases. This is actually one new – ish line on my “to try” list – thanks to lovely reviews on Cafleurbon. But, I think I’m getting too practical in my old age – I can’t keep up with all of the perfumes that I own, why do I need to find something else I love?!? Beside the fragrances listed already (Finisterre, Noir Tropical, Exultat, Sideris), I also have Cinabre on my list, a spicy rose. Really, are you thinking you might be done trying new perfumes?? Oh, I’ve thought that on and off for quite a while now. But then something comes along that piques my interest – like this line. And I’m a tester for Laurie at SSS so I’ll always be trying those new scents. Well. I first tried Hanbury blind, knowing nothing about the line or the perfume, at a perfume trade show in the middle of January in New York and it absolutely enchanted me. It smelled, as you say, like nothing else on the floor. It was like I had stepped out of the icy slush and much of synthetic musks into an Italian garden. I ordered the full pack of samples from Parfum1.com which at the time was quite reasonable (35$). I now have full bottles of Gershwin and Lady Day (the prettiest green gardenia I’ve ever smelled–no blue cheese or mushroom in sight, just gorgeous green and then a green version of the flower, you must try it R.). Hanbury and Barry Lyndon (beautiful hay, acacia, wildflowers, everything I wanted SMN Eva to be) are on my gosh-I-wish-I-could-get-those-smaller-bottles list. I did re-order samps of Hanbury even though I don’t wear it much because I couldn’t bear to not have it on hand. I wear Lady Day and Gershwin all the time. I will add that though I am officially a Maria Candida Gentile fangirl a bunch of them don’t work on me at all, Sideris included. The incense notes in them go completely bonkers. I’m putting this up to a high percentage of naturals and my skin. Oh, thanks for the great descriptions, Alyssa. Adding to my list, although I do love Eva too…have wished for a bottle of that for ages. I have so far avoided testing all of these – because I Have To Stop SOMEWHERE. But GAH I do love a beautiful floral. Sigh. Easy: stop after this one! Now I see… I am the (very unpaid) shill. Yeah, you can give up your samples, or you can give up your reason. The choice seems obvious to me.